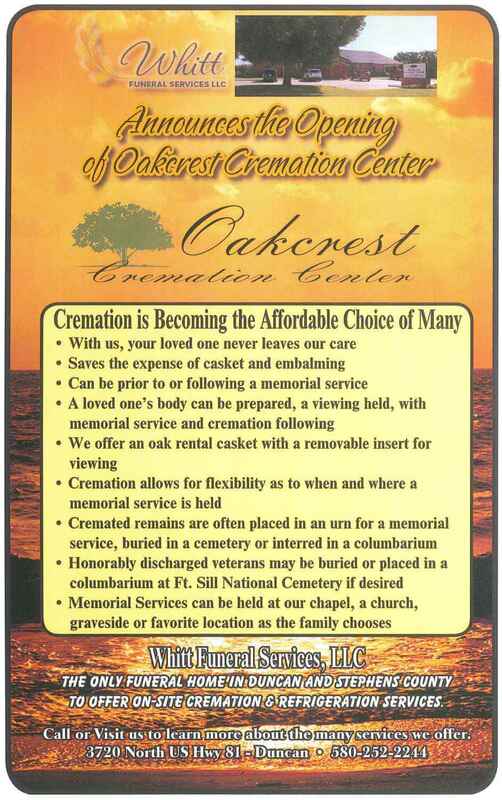 Oakcrest Cremation Center is locally owned and operated by Whitt Funeral Home. Cremation is increasingly becoming a popular choice of disposition. Neither a casket nor embalming is required. If a loved one's body must be held for several days, then we have a refrigeration unit that we can place the body into. Cremation, like burial, can be direct or after a funeral service. Direct cremation follows the issue of a permit from the Oklahoma Medical Examiner's office. This could take several days. A loved one's body can be prepared, a viewing held and a funeral service performed with cremation to follow. We offer an oak rental casket with a removable insert that serves as a cremation container for the choice. Cremation allows for flexibility as to when and where a memorial service can be held. A memorial service may be held with or without the loved one's cremated remains present. A memorial service can be held at our chapel, a church, graveside, or a favorite place the loved one enjoyed. A memorial service may follow the same format as a funeral except there is no body present at the service. Cremated remains are often placed in an urn for the memorial service, buried in a cemetery or interred in a columbarium (an above-ground structure containing permanent niches - urn receptacles). Cremated remains of honorably discharged veterans may also be buried or placed in a columbarium at Fort Sill National Cemetery if desired. Some families choose to scatter cremated remains on land, air, or water. Families need to be aware of the legal requirements and regulations when scattering cremated remains.